Are bonds or stocks riskier? Some say that equity markets are “risky.” In today’s world investors can buy 10-year Canada bonds yielding less than 2%. Given inflation in Canada which averages between 2% and 3%, it seems to us that bonds are incredibly “risky.” This is because after the effects of inflation an investor would be guaranteed a loss of purchasing power over 10 years. For a taxable investor the situation is even worse as the government will take up to 50% of your 2% yield, thereby making the total loss of purchasing power over the 10-year term even worse. A Leon Frazer portfolio, on the other hand, has a higher (dividend) yield than a 10-year bond. 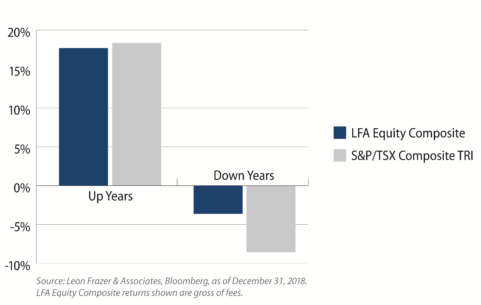 Over the long-term, companies that pay and grow dividends significantly outperform the broader market, with the added bonus of also being less volatile. A sustainable growing dividend limits downside to a stock during periods of market panic and provides a consistent signal of progress as time passes. 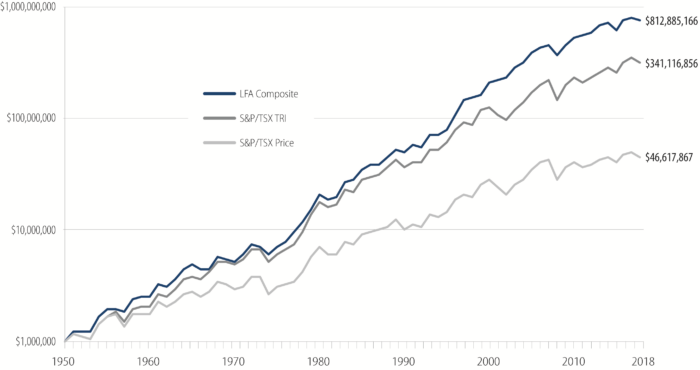 According to our research, over the past three decades, 73% of Canadian stock market performance can be explained by the increases in the underlying dividends.